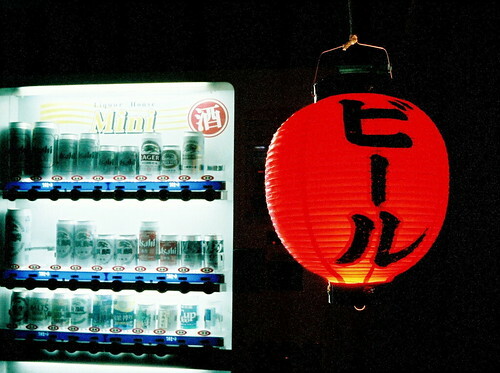 I promise it’s my last Japanese summer post. And then it’s on to the American summer posts. Or perhaps I’ll even engage in the dreaded “double posting” where the past and the present are ping-ponged in a frustrating and completely unintelligible fashion. 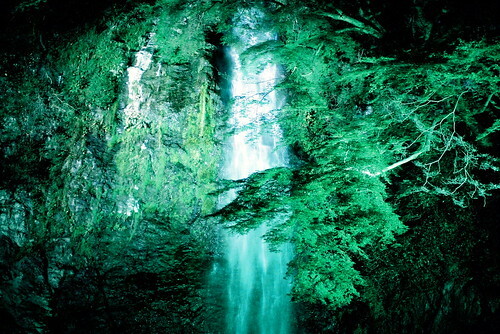 In any case, my former colleague Tim Gould came to stay with me down in the Kansai for a few days this summer and one evening, quite spontaneously, Tim suggested that we take a hike up to Minoh Falls, which is about half an hour from my house. This turned out to be an incredibly fortuitous decision since — for one week and one week only — the falls were going to be getting their summer illumination. 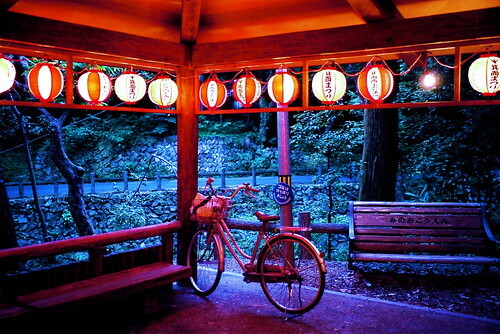 Like so many other temples and parks, Minoh Park is wired for light and a few times every year the lights are turned on so that people can wander on the mountain at night under strings of lanterns. 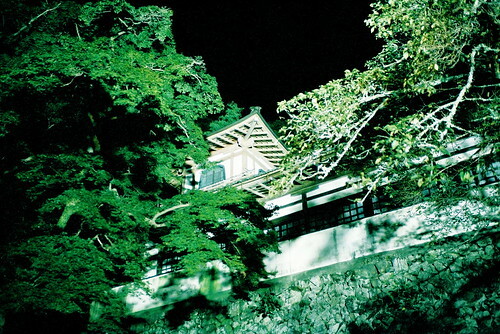 Of course, great banks of lights illuminate the most prominent sights, which, in the case of Minoh, would be Ryuanji Temple, with its famous red bridge, and Minoh Falls. This lovely rest stop can be found at the bottom of the trail that leads up to the falls. 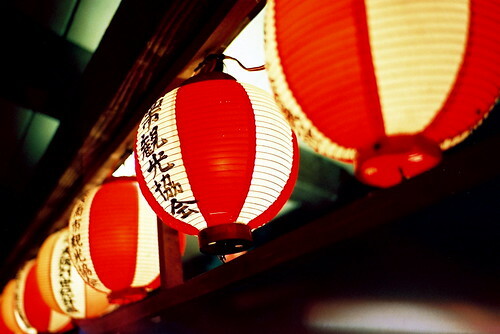 Strings of these lanterns were hung all up and down the trail, bobbing in the trees somewhat like red and white fishing floats. 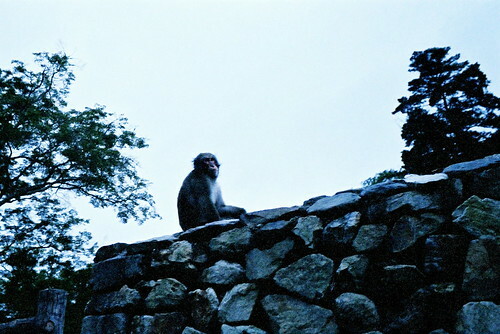 Of course, Minoh is especially famous for its monkeys and they tend to come out in the early evening. I think this is a male monkey, and I think it may even be the same one that attacked us later at the red bridge. 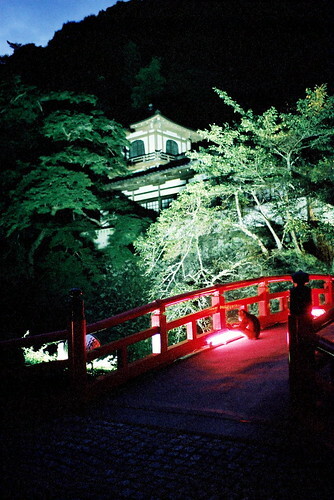 If you look closely at this photo of Ryuanji Temple, you can see a monkey sitting by the fluorescent bulb that illuminates the bridge, seemingly warming his hands. I’m actually not sure how much heat a fluorescent bulb actually gives out, so the more likely possibility is, in fact, that the monkey was just tripping out. And we were, in turn, tripping out on the monkeys. There was a small tribe of monkeys on the bridge, including several babies. Tim and I decided to keep a healthy distance, and the monkeys seemed to be paying little attention to us, except to occasionally look over with a “yeah, we’re cool with your vibe” kind of look. Unfortunately, a younger couple came and joined us and started snapping away with their camera phones. As the girlfriend got closer and closer in an attempt to get a clear shot of the “kawaiiiiii!” little monkeys, Tim and I started to get a little nervous. And sure enough, one photo-phone flash too many and the parents decided to put on a show of force. Monkeys can be quite fast when they want to be, and there’s nothing like having monkeys howling at you and jumping up and down in your face to make you realize that it’s a good time to beat a hasty retreat. A closer shot of Ryuanji temple. Up higher along the path we encountered this group of moth catchers, probably affiliated with the Minoh Insect Museum. They only had small moths in their nets, but in the course of the evening Tim and I saw several large, soft, ghostly white, lunar moths, and several large hawk moths as well. 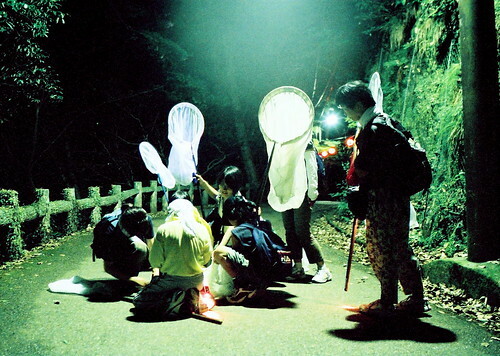 In fact, it was pretty amazing how many large moths were circulating in the night sky around Minoh, invisible to knowledge except in illumination. 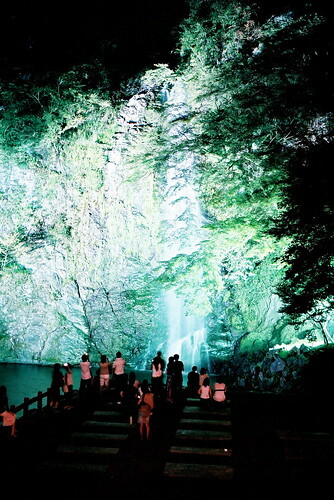 Here’s a shot of the famous waterfall at Minoh. The most famous photos of this waterfall feature these same trees — Japanese maples — in their orange and red autumn hues.